HF: New information added by Chris – image of Chan and source, and further information in his comments added to the main article. And HF re Chan’s death near Brothers Islands. Chan Lim Pak (also, Chan Pok Yim) was born in 1884 in Nanhai ( Namhoi) Guandong and died on 24th December 1944. Our main concern might be his involvement in Fook Hing and other HK companies. Can anyone supply further details about his manufacturing interests here? But the end? “Two ships? Chris suggests, “As for the name of the ship, I suspect “Reinan” is just the Japanese rendition of “Lingnan” (嶺南)”. Two final destinations? Or, as one account has it, was the ship bombed while moored to a pier in Hong Kong? The Dictionary of HK Biography states he died, “near the Brothers Island off coast of Castle Peak.” These can be more easily identified as being to the East of HK International Airport. And one, two or three concubines? This image of Chan was sent by Chris in his comment below this article. “Who is Who in China” (3rd edition, 1925) published by the China Weekly Review, Shanghai. This article was first posted on 30th October 2014. 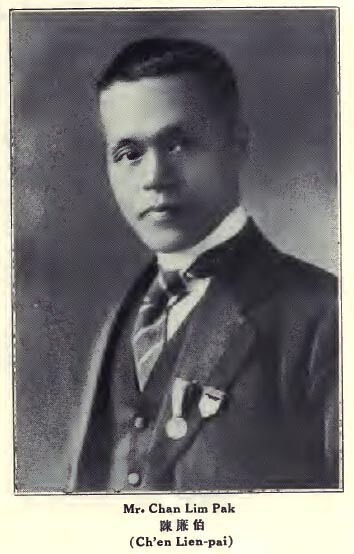 The source of the photograph is “Who is Who in China” (3rd edition, 1925) published by the China Weekly Review, Shanghai. As for the name of the ship, I suspect “Reinan” is just the Japanese rendition of “Lingnan” (嶺南). I have added the first photo of Chan Lim Pak you mention to the main article. I think you are probably right about the ship’s name. Do you know if the Tung Wah website provides details of his life which might be of interest to us? The Tung Wah Group of Hospitals web site mentions that Chan is one of the two principle directors in 1931, and the chairman in 1932. The organisation goes by lunar calendar, so “1931” includes the beginning of 1932 and excludes the beginning of 1931. Also on the web site are two articles about a talk and a visit by Dr. Joseph Ting about collaboration between Tung Wah and Guangzhou (Canton) charity organisations. 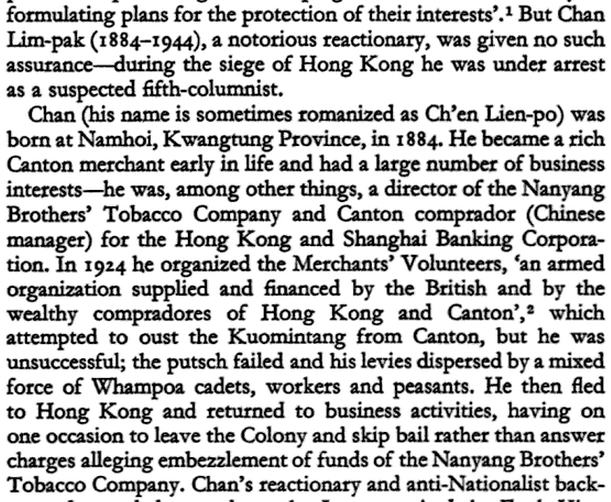 The articles state that in 1919, Chan was a comprador of Hongkong and Shanghai Banking Corporation in Shameen, Canton, and the chairman of Guangdong Food Relief Association (廣東糧食救濟會). I am actually the original author of the Chan Lim Pak entry in the DAHKB. For more details about Fook Hing Oil, please refer to Stanley Kwan’s “The Dragon and the Crown: Hong Kong Memoirs”. Stanley – better known as the father of Hang Seng Index – was actually related to Chan by marriage – his father in law Chan Yue-chik was Chan Limpak’s 9th uncle. (Yuechik’s father and Limpak’s grandfather Chan Kaiyuan founded the first modern silk weaving mill in China). Fook Hing supposedly had the monopoly of locally refined and imported edible oil and Kwan’s uncle actually was one of Fook Hing’s distributors. My account of his death was also mentioned in Philip Snow’s “Fall of Hong Kong” which essentially was the story that was repeated in the Chinese community. The other version can be found at below Gwulo link which is the 1944 HK News article reporting Chan’s death and the Japanese Army controlled press claimed that Chan was killed by machine gun bullets fired by the Americans. Kwok Lam-po (later chairman of Wing On) and his wife Silvia Li (sister of Li Tse-fong and Li Kwun-chun) were also on board the Lingnan Maru – they were knocked unconscious but were miraculously rescued and that experience prompted him to be very active with the YMCA and other Christian causes after the war. David Lam, the late governor-general of British Columbia was originally supposed to be on the Lingnan Maru but gave his ticket to a cousin who sadly perished. CHAN LIM PAK陳廉伯 (CHEN LIEN PO) . BAAG comments: “Chan Lim Pak, one of the 4 Chinese representatives in Hongkong and a notorious collaborator, was killed while on his way from Hongkong to Macao on board the Ling Nam Maru 嶺南丸, which was attacked and sunk by Allied planes on 23 Dec 44”.